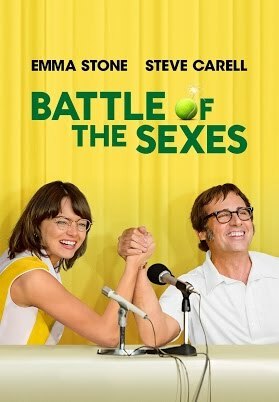 I watched the biopic Battle of the Sexes last night, and while it wasn't a perfect movie, it was interesting and definitely worthwhile. The story of how a tennis match between 29-year old Billie Jean King and 55-year old Bobby Riggs become the focal point of women's liberation is fascinating in and of itself. As famous as she is, I feel like King has never really gotten the full credit she does for being a pioneer. She put everything on the line for women's equality, and while she got outed as a lesbian and and apologized for her "fling," she later became a terrific LGBT activist. As a writer of historical fiction, I'm always interested in seeing how another writer captures an era. Granted, my eras -- the 18th century American frontier for Man & Beast and Man & Monster, and 5500 BC for the Drowning World series -- are quite a bit earlier than BoS! Nonetheless, it's always instructive to see how a book or movie captures another time. What details do they focus on to help the reader visualize that time and place? What do the characters wear, how do they dress and speak? Do they effectively convey how different social mores were? That last one often depends on who is telling the story, not to mention what the story is. Movies are still usually told by men and are about men, usually famous white men. Which means the parts of history about how women and other minorities were treated (badly) often gets dropped by the wayside. As an author of historical fiction, those are details I always strive to include. As for BoS, it's a little by the numbers, like biopics can be. But when it comes to the sexism that women faced at the time, the condescending attitudes from men in power toward women, I have to say BoS qualifies as a grand slam. If you're at all interested, or have no idea why you know the name Billie Jean King, you should check it out!